Girl’s night done right! When one of my blogger besties, Melissa of Always Meliss, and I discussed having a little girl’s night this past Friday, we started brainstorming some fun things to do together. Now, we can have fun doing just about anything (workout classes included). However, this time we decided to ditch the sweat for a little pampering and TLC! 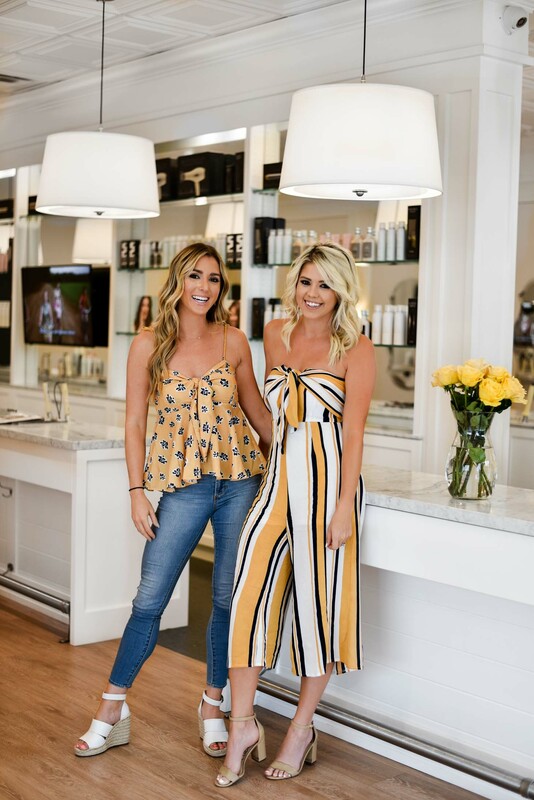 We partnered up with the DryBar location in the Scottsdale Lincoln Plaza. We decided to get a blowout and head to one of our favorite Fox Restaurants nearby: Blanco Tacos and Tequila. I mean… pampering PLUS margaritas and guac?! Duh! Now, if you follow along with me on my Instagram, you know that I am a big fan of the DryBar. I am a Member and book a blowout a couple times per month. You end up saving some money by having a membership AND your blowouts roll over to the next month. Meaning, you can always use them and never lose them! I absolutely love this concept! Also, 10% off products so I can smell like I just left the DryBar any day of the week? An extra perk for sure! First of all, this place is the cutest little salon ever! I love that each DryBar salon I have been to has been bright, airy and clean. I truly hate all things dark and dank! Their salons are the exact opposite of that! I always feel happy and relaxed when I’m there! The hospitality and staff treatment is topnotch! From the moment you walk in the door you are greeted with first class service. The girls are super attentive and get you set up with something to drink and get you back to a chair right on time. That’s right. I’ve never been taken late! So punctual! The blowout process is like a well-oiled machine. Meaning, they get you back to discuss the plan, get you shampooed, blowdried and styled in under an hour! I know that I don’t have to commit a huge portion of my day to getting my hair done. I love that you are in and out and onto the next thing. I always know what to expect for my day and plans ahead! I have never loved my hair more than when I get it done at the DryBar. It’s always the cleanest, healthiest and lightest it’s ever felt. I think they are secretly magical hair fairies or something! I always laugh that I leave feeling like my hair is longer AND lighter. Not sure how that is even possible, but it’s true! It always looks so amazing! There is no other comparison! I love that my hair lasts for days! I always ask for a little bit tighter and bigger when I go in, knowing that by day two and three, my hair will be looking perfect. You can even milk one of their blowouts a couple extra days if you throw in a little dry shampoo and their famous Triple Sec! Seriously, it’s my absolute favorite hair product! I love that you can really get your time and money out of one of their blowouts. I have even gone in the day prior to an event because I couldn’t go that same day, and my hair looks like I just got it done the day after. They work some serious magic up in there! Melissa and I had the best time getting pampered and all dolled up for the night. We had a delicious dinner (with all the guac a girl could want) at Blanco and enjoyed a fun night of good conversation and friendship! Consider booking a blowout with your girlfriends for your next girl’s night out! You’ll have the best time! Thank you to the DryBar for sponsoring this post!